Sovereign Fund & Institutional Investor Services - Change & Strategy International. Deliver sustainable change. 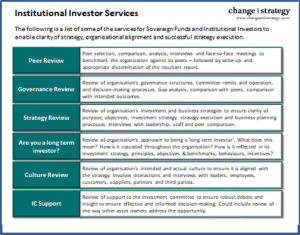 The following is a list of some of the services for Sovereign Funds and Institutional Investors to enable clarity of strategy, organisational alignment and successful strategy execution. Peer selection, comparison, analysis, interviews and face-to-face meetings to benchmark the organisation against its peers – followed by appropriate dissemination of the resultant report and engagement with the leadership and key influencers in the development and execution of an action plan. Review of the organisation’s governance structures, committee remits and operation, and decision-making processes. Gap analysis, comparison with peers, comparison with intended outcomes. Detailed engagement with the leadership and key influencers in the development of a recommendations report. Review of organisation’s investment and business strategies to ensure clarity of purpose, objectives, investment strategy, strategy execution and business planning processes. Interviews with leadership, staff and peer comparison. Review of organisation’s intended and actual culture to ensure it is aligned with the strategy. Involves interviews with leaders, staff workshops and anonymous surveys, peer comparisons and analysis. Engagement with the leadership and key influencers in the production of a recommendations report. Review of support to the investment committee to ensure robust debate and insight. Could include exploring the applicability of a ‘checks and balances unit’, a ‘Total Portfolio Management’ unit or a combination of the two.